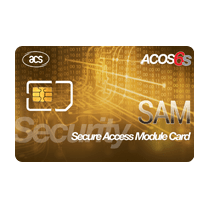 The ACOS6 Secure Access Module (SAM) is designed as a general cryptogram computation module or as a security authentication module for ACOS contact client cards - ACOS3, ACOS6 and common contactless client cards - DESFire, DESFire EV1, Ultralight-C and Mifare Plus. The ACOS6-SAM card securely stores cryptographic keys and uses these keys to compute cryptograms for other applications or smart cards. Using this, terminals need not know the master key(s) of an application, whereas the keys never leave the ACOS6-SAM. One application of how the ACOS6-SAM enhances system security can be seen in e-health transactions, as when a doctor or a patient inserts his or her ACOS smart card into the card reader, which prompts the ACOS6-SAM to use the proprietary information it contains to verify the validity of the card.